Well I don't get a lot of days off of work so when I do, I like to enjoy them. And Jenny has been working a lot more lately, helping another office on some Monday's and Wednesdays. I went to the lake Friday night with a friend to check my A/C situation in these 70+ days of 100+ degree heat. It's difficult to cool down a place 30-40 degrees!! We stopped and had dinner at Rosie's Tamale House on the way back. The following day, we loaded up the family and headed back to the lake for all sorts of ice cream and corndog fun!! Even a little dip in the lake. However, instead of risking a bad A/C situation we spent the night with Aunt Brittney at her house at the lake. As Uncle Cary was in Dallas training and driving NASCAR racecars for fun! As we left the lake on Sunday, smelling smoke in the air, we saw an enormous blaze in the hill country in Spicewood. Cary and Brittney began evacuating their house. As did other friends in the Austin, Texas Oaks neighborhood. Apparently, due to the high winds, low humidity, and extreme drought and heat, many fires started all over the area. 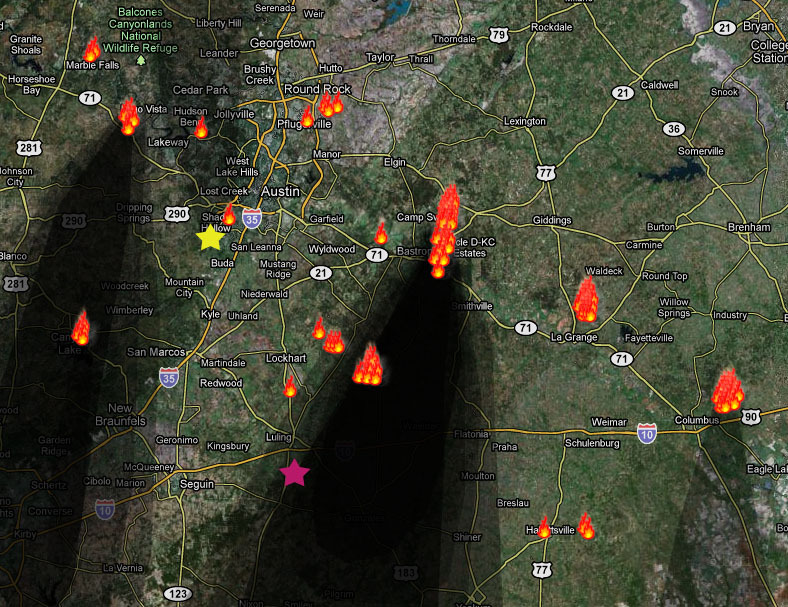 Bastrop got the worst of it, which turned out to be the largest fire in Texas history. On Monday, as the family drove North across Lady Bird Lake, looking over downtown toward the East, an enormous smoke cloud ominously loomed over the city. WOW, I have never seen anything like this in Austin! In better news, Chuck E. Cheese was good to GMAC and Grace for Cooper's 5th Birthday Party!! What a weekend.